Unless stated, all resistance is measured at an ambient temperature of 20 C (68 F). Resistances measured may be outside the specifications if measured at high temperatures, i.e. immediately after the vehicle has been running. Measurements should be made after the engine has cooled down. When connecting a connector, press firmly until you hear the lock close with a "click" sound. NOTICE: As a waterproof connector cannot be checked from the backside, check by connecting a sub-harness. If there is any dirt on the terminal, clean the contact point using an air gun or shop rag. Never polish the contact point using sandpaper as the platings may come off. If there is abnormal contact pressure, replace the female terminal. If the male terminal is gold-plated (gold color), use a gold-plated female terminal; if it is silver-plated (silver color), use a silver-plated female terminal. Never make the wire harness come into contact with a high temperature part, rotating, moving, vibrating or sharp-edged parts. Avoid panel edges, screw tips and similar sharp items. (a) For an open circuit in the wire harness in Fig. 1, perform a resistance check (step b) or a voltage check (step c). 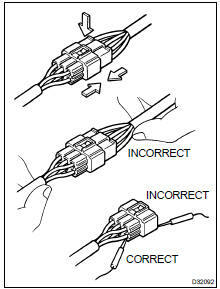 Disconnect connectors A and C and measure the resistance between them. Disconnect connector B and measure the resistance between the connectors. In a circuit in which voltage is applied to the ECU connector terminal, an open circuit can be checked by conducting a voltage check. Fig. 4: With each connector still connected, measure the voltage between the body ground these terminals (in this order): 1) terminal 1 of connector A at the ECU 5V output terminal, 2) terminal 1 of connector B, and 3) terminal 1 of connector C.
(a) First check the ECU ground circuit. If it is faulty, repair it. Measure the resistance between the ECU ground terminal and body ground. Disconnect the ECU connector. Check the ground terminals (on the ECU side and wire harness side) for evidence of bending, corrosion or foreign material.